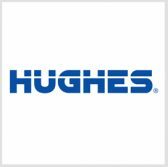 Hughes Network Systems has delivered an initial batch of satellite communication modems to support beyond-line-of-sight operations of General Atomics‘ remotely piloted aircraft. The HM400 satcom modem uses an open system architecture and software-based waveform technology designed to address MQ-9B SkyGuardian operational requirements, Hughes said Thursday. Rick Lober, vice president and general manager at Hughes’ defense and intelligence systems division, said the company customized the technology to help General Atomics’ aeronautical systems business meet communications-on-the-move requirements for the SkyGuardian RPA. The modem is built to support military satellite frequencies and transmission of high-definition video and data even in harsh or contested environments.